Would you make a good concierge? Take our career test to find out how you match with this and over 800 other careers. What is the workplace of a Concierge like? A concierge is someone who is often the master of the ins and outs of their locale. All high-class reputable hotels have these cordial, quick-thinking people in their employ. They are most often recognized as the face of the institutions they serve. They know how to find attractions and places of interest for the guest or client, as well as have a rolodex of names and numbers that can facilitate any unique and challenging requests. The beginnings of this profession can be traced back to the medieval era. French noblemen left the care of their castles, its residents, and their guests in the hands of an individual. These persons were called the “keepers of the candles" or “comte des cierges” in French. They were entrusted with the keys of the castle. Although the job today still entails making either the stay or travel of an individual memorable, it has gone beyond this level of service. What a modern-day concierge does depends largely on the type of institution or facility employing him or her. This is due mainly to the fact that the needs of the clients or guests of these facilities vary. Thus, the responsibilities of those who work for a hotel varies somewhat from those who work for cruise ships, casinos, resorts, private individuals, corporations, and so on. There are duties and responsibilities, however, which are common across the board. Foremost among these is attentive communication. Concierges are often the people guests and clients go to when they have concerns or needs they want met. Communication can be done in person, over the telephone, and, more recently, over the internet. Another common responsibility of the concierge is being an information resource on how to enjoy the services offered by a facility, as well as those found in its surrounding areas. Concierges are expected to be able to know the best possible routes from one point to another, whether by foot, by taxi, by public transportation, or by private vehicle. People look to a concierge to find information on events, tourist spots, destinations, and other things that they may be interested in. As well as being a reliable source of local information, part of the job is to be able to book guests into different events, to make reservations for them at their intended destinations, or to find and purchase tickets. They can also help make appointments or assist in arranging the client's or guest’s itinerary so that they are able to make the most of their stay. Are you suited to be a concierge? Concierges have distinct personalities. They tend to be enterprising individuals, which means they’re adventurous, ambitious, assertive, extroverted, energetic, enthusiastic, confident, and optimistic. They are dominant, persuasive, and motivational. Some of them are also social, meaning they’re kind, generous, cooperative, patient, caring, helpful, empathetic, tactful, and friendly. Does this sound like you? 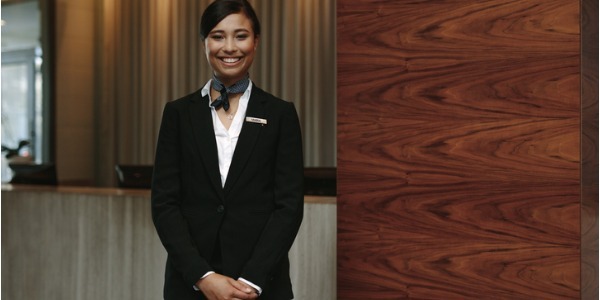 Take our free career test to find out if becoming a concierge is right for you. A concierge is no longer limited to hotels and resorts. They are found working on cruise ships, for travel companies, corporations, community care facilities, and even private individuals. They sometimes work in teams headed by chief concierges. Various aspects of the job are assigned to certain team members, so the workload is distributed and easier to accomplish. Furthermore, some companies offer concierge services to private individuals and companies. This means that going into private practice, and then later owning one’s own company, is a distinct possibility.